Note from Raelyn: We haven’t had a post about guest posting so far, so I thought it would be great to get a seasoned guest poster who writes guest posts for his company to come on here to share his guest posting strategy. Let’s welcome Callum, a seasoned writer who guest posts for a PPC marketing agency. Guest posting needs to be part of your strategy. Read on to learn the 6 crucial steps that you need in order to craft a solid guest posting strategy! Guest posting is the process of writing and publishing an article on someone else’s website or blog, ideally at an authoritative site. One of the biggest advantages of guest posting is that it enhances the Search Engine Optimization (SEO) of your site by improving the ranking of your search results. While you can also improve SEO through a Private Blog Network (PBN), or a network of sites that link back to your website, guest posting is a safer and easier way to get backlinks. Gain more visibility for your business. Attract new readers to your site, which may, in turn, attract new subscribers. Build trust by being on an authoritative site. Help others see you as an expert. Build the reputation of your business. Guest posting also benefits the site’s owner, as your post will help them to meet their content needs. 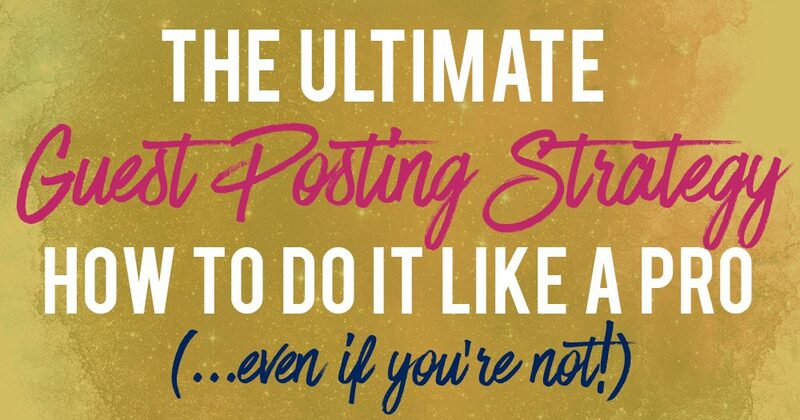 You want to have a great guest posting strategy to secure and write guest posts successfully. As with any business strategy, your guest-posting campaign needs to start with goals. Getting exposure to your website through increased traffic. Positioning yourself as a well-known authority in your industry. With some great content and by targeting the proper blog sites, you can achieve all three. If you want to start by only looking to build backlinks, then you need to target sites with strong root domain authority, or high results on search engines. You can use a tool like Ahrefs, SEMRush or Moz for this. If you want to gain exposure and position yourself as an authority, then you want to guest post on sites with large and engaged audiences. Knowing and focusing on your goals in advance will help you to focus on identifying which sites are best suited for your guest posting efforts. Now that you have your goals in mind, it’s time to start the campaign. Finding sites to guest post at can seem like a daunting task, but there are tactics to make it easier. Outsource the searching to a freelancer on a platform such as Upwork. While it’s true you may already have some sites in mind for you to target your campaign, searching for quality, relevant sites is an important step. There are other search options available to you, such as doing a Twitter search for “(Keyword) guest post,” or doing a Google search of a popular guest poster in your industry to see where they have posted. But if you want to explore further automating the process, there are some tools available to your business. 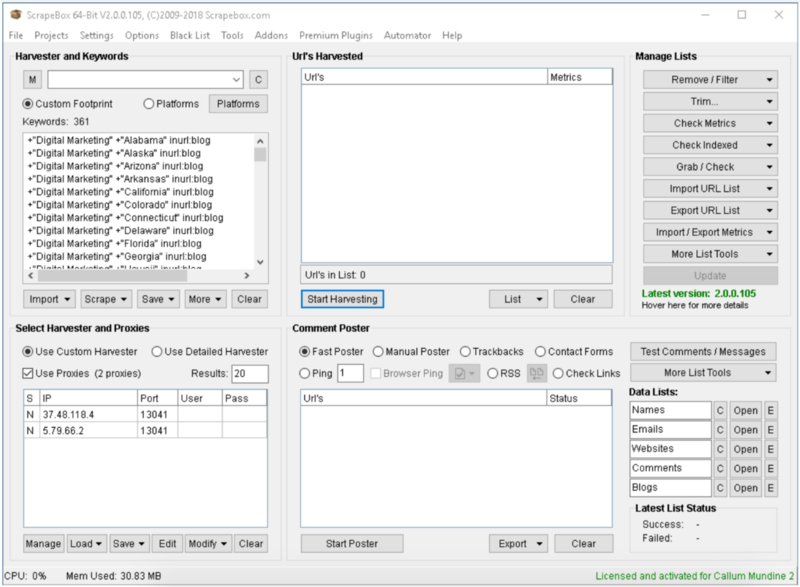 Scrapebox, for instance, helps you to automate the process by harvesting a list of URLs for you from your multiple keywords you type into it. It also allows you to remove duplicate URLs, look up the page rank, and export the results. A downside would be getting less than ideal websites in the search results, which means you have to go through them to determine suitability. The Scrapebox software is $97. Another tool is Ahrefs, which has a site explorer that you can use to find link targets. 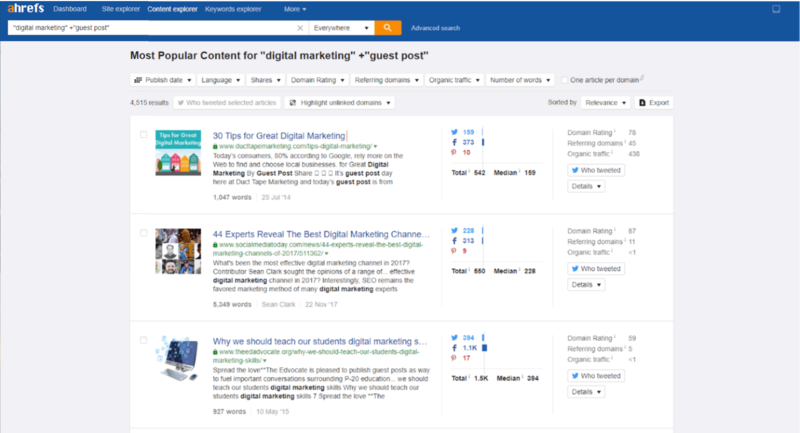 In the below example, under Content Explorer, I search for “digital marketing” + “guest posting”, which will yield different sites that I can check out. Ahrefs is a popular digital marketing tool used for tasks such as doing backlink analysis, providing URL rankings, and doing SEO analysis. If you want to invest in it, there are a variety of monthly subscription plans, or you can do a 7-day trial for $7. These are some of the ways for you to get a comprehensive list of targets for your guest posts. Once you have a list of prospect sites for you to guest post at, get to know those sites. Get to know the content of the blog. Read the content consistently for a week or more to understand the sites and their audience. Check out other guest posts on the blog, to see what worked. Examine which blog posts got the most reader engagement through likes or comments. See who the other guest bloggers are – you can even check where else they have done guest writing to add to your list of prospects. Become known to the prospect by commenting on existing posts, signing up for their newsletter, or re-tweeting posts, for instance. Connect with them on social media. These are a few examples of ways to know and understand your prospect sites. Once you feel you know the prospect and the blog site, you’re ready to contact them. While it may be tempting to automate this step, building a relationship will be more important, and serve you better, than automating emails to send to every prospect. Rather than talking to them, talk with them, having a conversation about why your guest post will benefit both of you. Keep the pitch short and use the title of the proposed article. Emphasize the benefits to the site owner of having you do a guest post. Be open to letting the site owner know your goals for guest posting, whether that’s traffic to your site, a link in your author bio, or a link directly from your post to your site. Make sure you don’t pay for a guest post placement unless you want to openly promote a service or product. The site owner will be getting your great content, which is a benefit to them, so you shouldn’t have to pay for placement. Your entire strategy and time spent to this point will be lost if the end result is a poor quality post. It’s absolutely crucial to have a quality piece, whether your goal is building backlinks, getting exposure, or positioning yourself as an authority. It’s all for naught without a great article to back your efforts up. Outsource writing to a quality freelance writer found on a platform such as Upwork. Be sure to follow the guidelines of the site to which you’ll be posting. A great headline. If you’ve included it in your pitch, you can also provide alternatives. Research keyword phrases so your guest content ranks high in search engines. Include relevant internal and external links to help with SEO. Format your post so it matches others on the site, including subheadings, lists, capitalization, etc. 6. Finally, be sure to invest time in your bio. This is where you can create a link to your home page, a social media link, or both. Choose the link to fit your guest-posting strategy. For instance, if you are trying to build your email list, you want to send readers to a landing page to sign up for your newsletter. If you are trying to rank for a particular keyword, you want to link to the relevant blog post. Make sure you check the guidelines: Site owners typically have guidelines for the bio section as well, such as the number of links that you are allowed for one guest post. A guest-posting strategy does involve some hard work, but that work will pay off in increased exposure and traffic for your website. Once you’ve been successful with a guest post, be sure to promote it yourself, through your email newsletter, social media channels, and on your site. The site owner will appreciate the promotion as well. And once you’ve had success, continue your efforts with additional guest posts on your targeted sites. After all, success breeds more success! Author Bio: Callum Mundine is part of the marketing team at oneegg.com.au, a PPC management agency. He is an Amazon marketplace & white hat link building specialist and has launched multiple successful brands on Amazon.com. Callum like his eggs boiled. Thank you Raelyn for this lovely post. I shared it on Pinterest and Twitter. What I love to do is to write content first and than to find prospective site. It is much easier to search for appropriate sites when you have your post ready. I’m not saying that this is the best strategy, but it is the one that suits my style. Yes, there are many different ways to guest post for sure that boils down to personal preference!